One would think that orange peel extract is something to be used only in the kitchen. This is certainly the case with extracts of a number if fruits and herbs. Whether we're talking about extracts, tinctures, or essences, what is being discussed is a highly concentrated form of a food item, or of key ingredients in that food item. In the kitchen, extracts are mainly used to flavor dishes. On the other hand, the druggist will use tinctures and extracts for the concentration of certain ingredients for medicinal properties. Extract Production - - The orange peel extract is more apt to be found in the drugstore than in the kitchen, as one if its key ingredients has proven to be beneficial in the treatment of certain medical conditions. One can even make orange peel extract at home, although it may not be worth the time and trouble to do so. There are four general approaches to extracting essential oils from a fruit, such as an orange, or in this case, an orange peel. Expression is one way, which simply involves squeezing out and separating the oil when it is easy to do so. Absorption is a second approach, and involves steeping the item in alcohol. Some food items, such as peppermint, are made into an extract by simply crushing them into fine bits, called maceration. And finally, one can make an extract through distillation, and effective though sometimes expensive process. Great With Vodka - As far as the orange peel is concerned, expression and absorption are usually the methods of choice in producing orange peel extract. One can even make it at home by filling a glass jar with shaved orange peel, filling the jar with vodka, and then setting it aside to steep for several weeks. This method works if the goal is to create some oil of orange, or orange extract, for cooking purposes, but is probably not the best approach if one has a home remedy in mind. It would be very difficult to estimate dosage, and there is also all that vodka, not usually considered to be of good medicinal value. Treatment Of Heartburn - Most orange peel extract is sold over the counter in tablet form, and most of it is sold with one purpose in mind, relief from heartburn, a symptom of acid reflux disease. Orange peel extract has been found to be very effective in giving relief to heartburn sufferers, though physicians and scientists have not really been able to put their finger on why this is so. It appears however, that an ingredient in orange peel extract known as d-limonene plays a key role. D-limonene apparently aids in making food pass through the stomach more quickly, thus lessening the production of stomach acid. This ingredient also seems to prevent, at least to some degree, the backup of stomach acid into the esophagus, the principal cause of heartburn pain. Just how this is actually accomplished isn't really clear. This is a case of something working well which can't be explained. Add to that the fact that adverse side effects are generally nonexistent, and you have a medication that does the job, though no knows for certain why. Two Cautionary Notes - There are a couple of items that need to be addressed. Heartburn is a symptom of acid-reflux disease, which, in its most severe form is known as gastroesophageal reflux disease, or GERD. 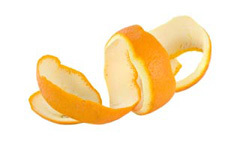 Orange peel extract treats the symptoms, and not the disease. In other words it provides relief, which may be all that is needed in milder cases of acid reflux disease. However, it does not treat the disease, and is not a cure. Severe or chronic cases of acid reflux disease or GERD should be professionally treated. Orange peel extract may be prescribed or recommended as part of the course of treatment to provide relief, but other means, sometime including surgery, may be necessary to cure the disease. The other thing to bear in mind is that orange peel extract should not be taken by pregnant women. The ingredient, d-limonene, is thought to be responsible for causing birth defects in laboratory animals. Whether this could be the case with humans has not been firmly established, but as a precautionary note, it's best for pregnant women to avoid orange peel extract entirely, and rely on antacids for relief of heartburn.